Joe Torres has the story. SARASOTA, Florida (WABC) -- A former NYPD officer got stuck in the middle of an unusual take-down. Police in Southwest Florida say Arnold Ring found an alligator in his front yard in Sarasota. 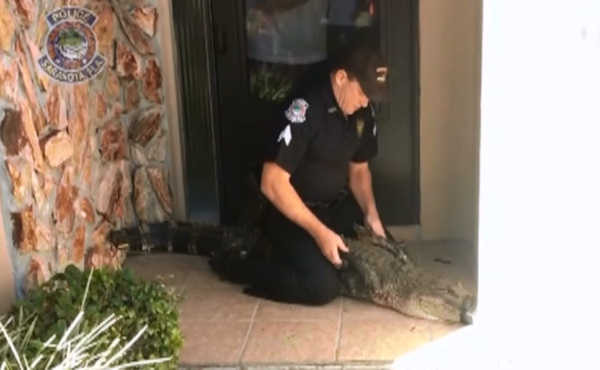 An officer quickly responded to move the large reptile. Luckily the gator had a taped snout, and a tag from a trapper. Ring says he was impressed with the officer's moves. "As a retired member of the New York City Police Department, I had a great career full of the most diversified activity you could ever find, but I never saw a Brooklyn cop ever tackle and lasso and secure an alligator," Ring said.